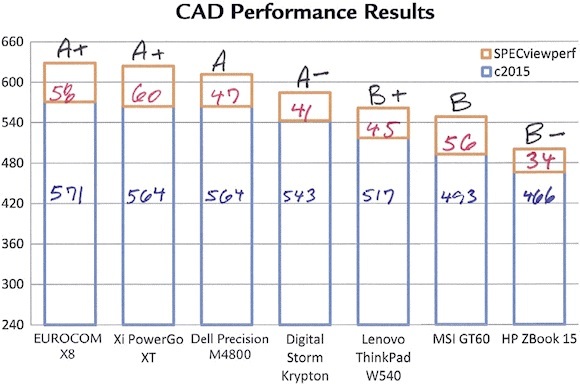 Well after one day with my new machine I thought I'd post the results here for anyone looking to move on from Dell. Eurocom were very easy to deal with. Answered a couple of questions I asked and responded within 30mins (6am Sat local) so I put this one together and asked about any freebies. I got an upgrade to 1866 mem, upgrade to 7200 HDD, and premium paste. After ordering I got an extra 330w PSU and adapter for dual use, and display calibration (supplied on cdrom) thrown into the deal. 4 days to build and test, 3 days shipping. Fingerprint reader works well but they usually do when new. Nice touch when benching is fan control. Instead of waiting until around 86c for the fan to get loud there is a hot-key to switch to full. And some in-game ones, all at maximum available settings. Not too shabby and temps are good. In-game high 60's ~low 70's on the GPU's and a max of 84c when benching. CPU maxes around 85c when stressed. The fans are quiet enough to not interfere with gaming but once you hit 85c it will become quite audible. The audio it is easily as good as the R4, probably a bit better. The sub-woofer and the position/angle of the speakers makes for decent listening sitting in front of it. 120hz Glossy Panel. Superb. Rock steady and the contrast is great, I'd say better than the R4 120hz glossy. I had a quick look in the BIOS but it's pretty bare. No CPU or overclocking options at all. I guess I could use XTU but ATM the CPU is way down my list, as is flashing the 980m's. I had planned to do a full review but now I just want to get back to some gaming. The games look so good I'm going to be doing a lot of second play-through's! Ask away if you have any specific questions, I'll do my best to answer them. when we received the Eurocom X8 for testing, we had no doubts that this 17.3-inch gaming monster would top our charts yet again and supplant our last year's Eurocom X7 in pure performance. Our X8 on hand houses serious hardware on all fronts, including a 3.1 GHz Core i7-4940MX, GTX 980M SLI graphics, 32 GB of overclocked DDR3 RAM, and a 120 GB Samsung mSATA SSD with a secondary 1 TB SATA SSD for good measure. 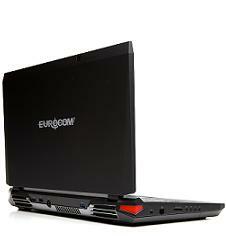 recommend the Eurocom X8 at more basic configuration levels. Its user-friendly expandability options give it very long legs compared to the more fixed models offered by other brands. This makes the X8 an ideal candidate for users who know they will be frequently upgrading and swapping components down the line. 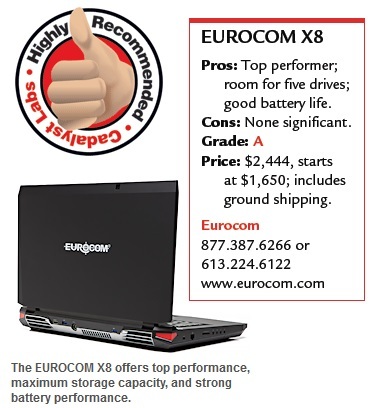 Fortunately, the EUROCOM X8 also set the bar in three more desirable ways for this roundup: top mark for total CAD performance, top index score for the Cadalyst benchmark, and maximum expansion capacity. 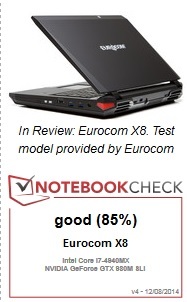 The EUROCOM X8's total combined score for the two benchmarks was 629 — tops for this review — earning an A+ for CAD performance on our report card. The EUROCOM X8 has four 204-pin SODIMM sockets for system memory. Two of these are filled with 8-GB 1,600-MHz DIMMs, for a total of 16 GB. The system supports a maximum of 32 GB. There is ample file storage provided by two drives: a primary Micron mSATA 120-GB solid-state drive and a secondary 1-TB SATA3 (7,200-rpm, 6 Gb/sec) hard disk drive. The external drive bay holds an 8X DVD+/-RW (dual layer) burner. Now, here's an amazing thing about the EUROCOM X8: there are still two drive bays available for additional storage space. The real advantage of the additional storage is it lets you get serious about RAID options with either maximum performance (striped drives) or fault tolerance (mirrored drives). This last option is a must-have for me personally. To have their workstations included in this roundup, vendors had to select units that met several criteria. The most important was that each mobile workstation must cost no more than $2,500, excluding shipping. We knew this would be a challenge; the average price of the mobile systems we've reviewed since September 2012 is $3,482. The prices for those five machines ranged from a low of $2,399 (14" display) to a high of $7,983 (17.3"). Several vendors obviously had to trim system configurations to meet our price point. If you are in the market for a mobile work-station, consider the reviewed models as a starting point, but don't hesitate to spend a little more if necessary to get a system that fully meets your needs.